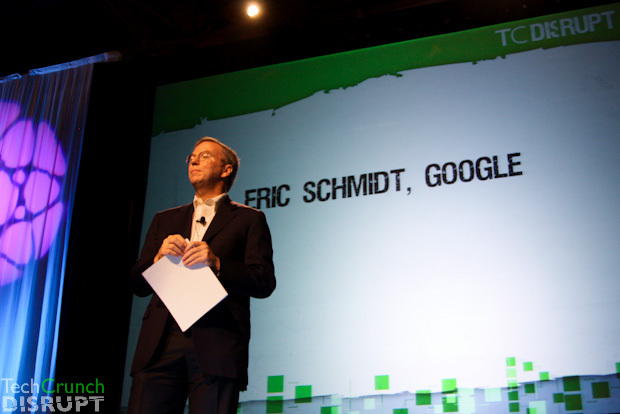 That was what Google CEO Eric Schmidt’s opening remark at our TechCrunch Disrupt conference in San Francisco today. He continued on to say that the people in the audience represent another transition in the ways people use computers. We now have “an augmented version of humanity,” Schmidt said. The future is about getting computers to do the things we’re not good at. Schmidt noted that it’s ridiculous that humans and not computers drive cars. “Your car should drive itself. It just makes sense,” Schmidt said. “It’s a bug that cars were invented before computers,” Schmidt remarked. Mobile devices are with most of us everyday now. And that will continue going forward, Schmidt said. And that doesn’t mean for the elite, this is for the average person, Schmidt made sure to note. “The smartphone is the defining and iconic device of our time,” he said. Those smartphones are going to continue to make all of our lives easier, according to Schmidt. They will make it so you can access information from anywhere. More, they’ll make it so “you’re never lonely,” Schmidt said. You’re always connected, and that means with your friends as well. “If you’re awake, you’re probably online,” he said. This is “a golden era of breakthroughs,” Schmidt said.